Some residents want Charlotte County to consider a large waterfront site for a new fire station on Don Pedro Island. 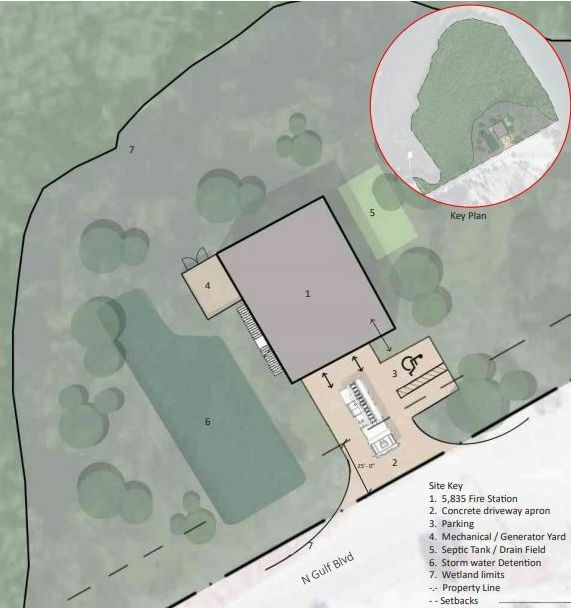 Charlotte County commissioners instructed their staff last week to step back from a location recommended on Don Pedro Island for a new $3.6 million fire station. Several residents of the bridge-less island spoke at the commissioners’ meeting against a proposal to build at 61 Gasparilla Way. “I’m just crazed that they’re not thinking of the bigger picture,” resident Candyce Cohen later told the Sun. Cohen is also a member of the Barrier Islands Fire Advisory Board. Representing at least 50 people of the small island, she is advocating for the use of a larger waterfront parcel, 1 Gulf Boulevard. The county’s consultants, Sweets Sparkman Architects and Magnum Builders, rated this site lower due to the cost of environmental remediation and an anticipated purchase cost. Commissioners had been expected to vote on one of three sites presented in the consultant’s report. The third site was the existing one, 101 Gasparilla Way, where the current station would be demolished. The current building is a re-purposed single family home built in 1991, and is too costly to maintain as a fire station, county officials have said. The county’s plan is to pay for the construction using county-wide capital improvement funds rather than the local municipal assessment funds. The islanders, about 660 households most of which are seasonal, pays five times the rate for local services compared to other municipal service units, due to their remote location on the Gulf of Mexico. The board voted unanimously to postpone a decision on a new site and to request a new assessment. “I’m not prepared to support this decision at this point,” said Charlotte County Commissioner Bill Truex. Commissioner Christopher Constance criticized the limitations of the consultant’s report and staffs’ search for options. “I would appreciated a little bit more diligence to make sure everybody who was available participated,” he said. The county’s report stated the price of the Gulf Boulevard property was unknown, although the owner had expressed willingness to sell. Cohen said she just asked the owner, Bill Caldwell, who spoke at the hearing. His appraisal set the price at $810,000 for the 1.12 acre lot, Cohen told the Sun. At that price, Cohen calculated county taxpayers would each pay only about $1.50 a year for seven years to buy the land. For that, they would receive water quality protection at a site that was ground zero for Red Tide last summer, she noted. To reduce the cost further, she suggested that the county pursue grants or low interest loans to buy environmentally sensitive land.